A Rhapsody in The Lost and Damned. 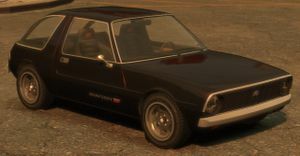 The Declasse Rhapsody is a two-door hatchback, appearing in Grand Theft Auto IV: The Lost and Damned and the "I'm Not a Hipster" Update for Grand Theft Auto V.
A Rhapsody in GTA V.
The sides and rear of the Rhapsody resembles an AMC Pacer manufactured in the 1970s, while the front bears similarities to a Volkswagen Golf Mk I. The Rhapsody's performance is considerably poor, and while the car's size and design makes it comparable to the Blista Compact, the Rhapsody's performance is worse. In addition to an average rate of acceleration and a poor top speed (115 km/h - 71 mph), the car is considerably heavier than the Blista Compact, making it harder to corner and brake. However, the Rhapsody's rear-wheel drive (as opposed to the Blista Compact's front-wheel drive) and more reasonable torque that minimizes burnouts as power is applied to the power train. The texture of the photograph on the Rhapsody's dashboard in The Lost and Damned. The Rhapsody's name is a reference to the film Wayne's World, specifically the famous scene where the two lead characters, Wayne and Garth, sing along to the song "Bohemian Rhapsody" by Queen while driving in the "Mirthmobile" (an AMC Pacer). A photograph can be seen within the Rhapsody depicting two people resembling Wayne and Garth, with their catchphrase "Schwing" written on the bottom of the photo. Furthermore, a "W" (as in "Wayne's World") is seen badged inside and outside the car. The photograph is blacked out in GTA V.
The Rhapsody shares its interior with the Stallion, like the Regina, with the Rhapsody badge stamped on the dashboard and doors; as such, the steering wheel on the Rhapsody bears Classique's logo rather than Declasse's. The Rhapsody looks similar to a vehicle featured in the 2006 Atari game Driver: Parallel Lines, which was also called the "Rhapsody". The Rhapsody plays the radio station The Beat 102.7 by default when entered. The Rhapsody can be found fairly regularly in Alderney and Bohan. This page was last modified on 25 June 2014, at 22:04.